During its E3 press briefing today, Electronic Arts announced a new game from Hazelight Studios and Josef Fares, the director of the acclaimed Brothers: A Tale Of Two Sons. Called A Way Out, it’ll tell the story of Leo and Vincent, two strangers who become friends in prison and break out together. It’s designed exclusively for split-screen multiplayer, and while you can find a partner online to help you through the story, you’ll still be seeing their perspective on the screen as if they were sitting next to you on the couch. It also takes a unique approach to split-screen play, where each player’s portion of the screen changes to reflect their perspective on the scene and what they’re doing. For example, the game’s first in-depth trailer shows a sequence where one player ducks in the back of a car while the other drives, posing as a cop. The driver gets a wide view of the street ahead, while the guy hiding in the back gets an appropriately limited view. 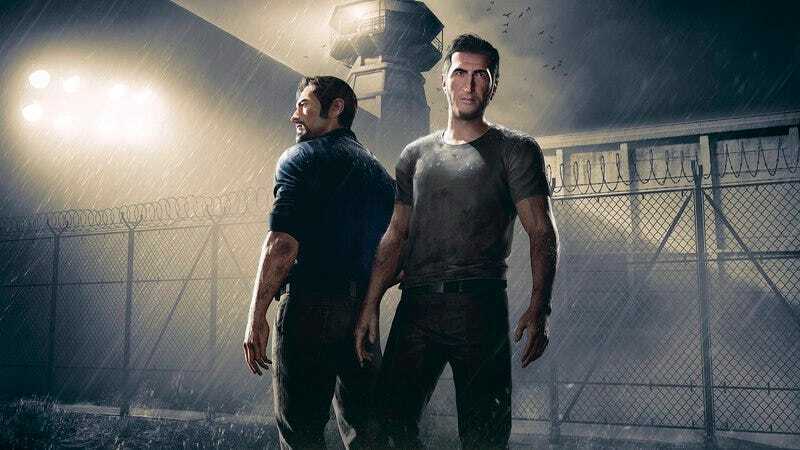 A Way Out is scheduled for release in early 2018 on PlayStation 4, Xbox One, and PC.